Rain, mud and more rain! Last week we continued work on the Seatoller car park. I initially went down there with two NT staff and a tractor intending to resurface it with dirt scree but the weather was so atrocious that it was just turning into mud porridge. Seatoller happens to be situated in the wettest area of England! There was no point in continuing when it was becoming so waterlogged so we abandoned the job about half way through. 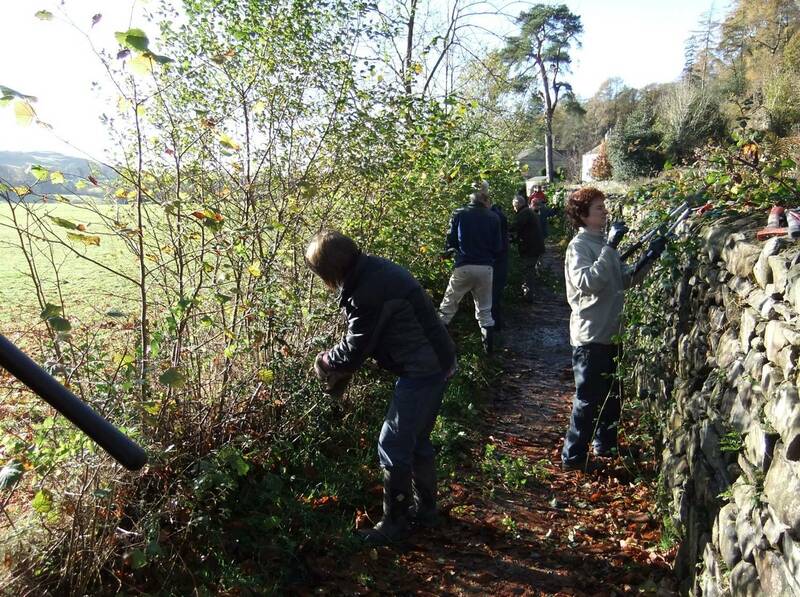 Once again my fantastic team of volunteers stepped in so I went back with them at the weekend and we did the job by hand. 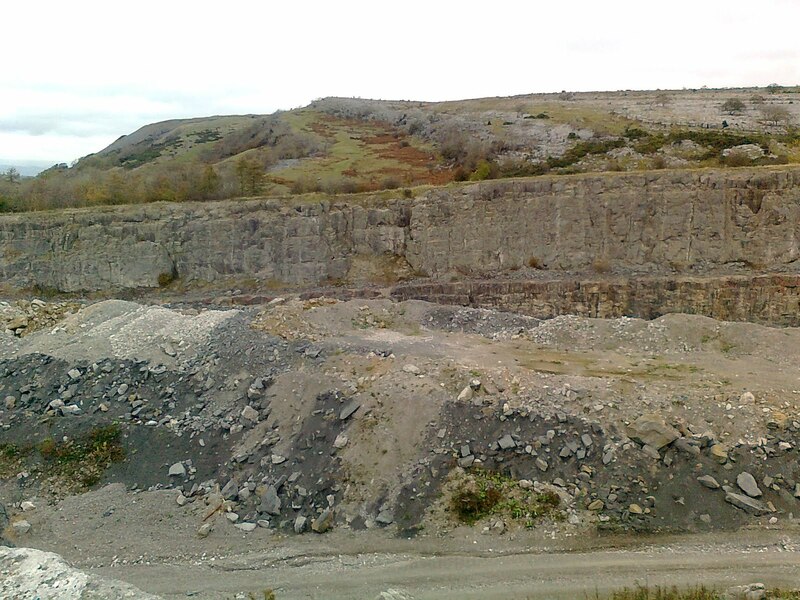 We moved and spread 16 tons of quarry waste (dirt scree or ‘25 to 1’). Despite the dreary, wet weather we have been having, I also managed to do some work on the winter’s hedging programme. I was up at High Snab Farm with Joe (another ranger) and we made a good start by stripping out a section and beginning to lay it. All being well, I’ll be back there next week with my volunteers to continue it. I’ve also had to clear another abandoned camp site. It is just a tiny minority who do this and spoil things for others. It does have to be cleared up though. It’s a stunning area that we want people to come and enjoy and it’s difficult to understand why anyone would leave behind such a mess. On a more positive note, I was out on a call with the Mountain Rescue Team. The air ambulance dropped off a paramedic and then flew a few of the rescue team up to Sharp Edge. We roped down to the casualty and lowered the paramedic to the site. We then secured the casualty and the Sea King helicopter came in and winched from the scene. Thankfully, the outcome is good and the casualty is going to make a full recovery. There were a number of agencies involved and it all went like clockwork. Natterjack Toads need clear open pools in which to breed. Over the years vegetation and silt have built up in our artifical breeding pools making them less suitable. We employed a contractor to remove the vegetation and silt from the pools and to relay the inlet pipes. The sides were re-profiled for a gentle gradient which the toads prefer. The water is warmer in the shallows. The project was funded by the Heritage Lottery Fund through a project run by Amphibian and Reptile Conservation. 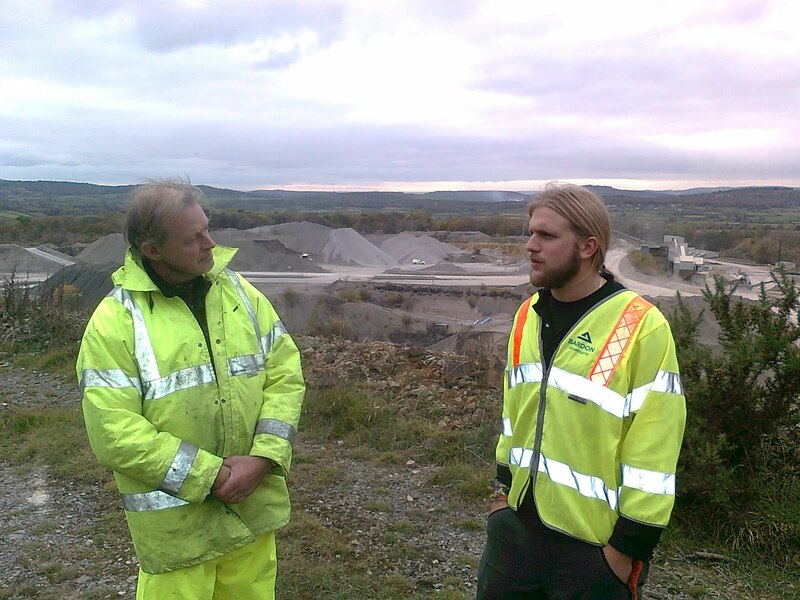 All works have been agreed with Natural England and measures were in place to minimise disturbance to wildlife. The story so far, lets hope they stand up to the winter weather! We don't need to tell anyone it's been a wet month, especially these last few weeks. Most people will have done their best to avoid the rain though, but we've not been so lucky. When there's a hedge to lay and a group of volunteers who've come here to lay it then we've got to be out whatever the weather! Not ideal conditions - the hedge after laying. So it was with some trepidation we headed out last Monday morning with the Chester National Trust volunteers for the first day of their week here. They have a regular slot here at this time of year and are always keen on a bit of hedgelaying. The rain and wind though was doing its best to blunt this keenness, but we find that it's normally a lot worse when you're indoors looking out at it than it is if you get out and get on with something. Chester National Trust volunteers ready to beat a retreat after a wet day. Fire cooked swede - lovely! A new one on us, the holiday leader threw three swedes, unpeeled, on the fire. After 45 minutes he fished them out and peeled them and they were lovely - cooked to perfection with a nice smokey flavour. There's always something new to learn! 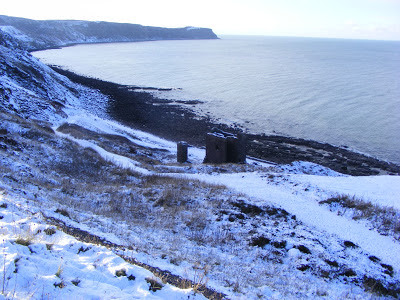 By Rob Clarke, Community Ranger. As the year draws on one of the major tasks for rangers is to inspect our trees. As you can imagine, it's no small undertaking and although quite a serious task, it’s also a great excuse to look at some beautiful trees and fungi! So off we go, armed with hammers, binoculars and a pokey stick. Doesn’t sound very technical I admit, but it’s amazing what these simple tools can tell you. It’s not always just the tree itself we investigate. Possible problems can be obvious. Above is a fungus we found on a Douglas Fir. 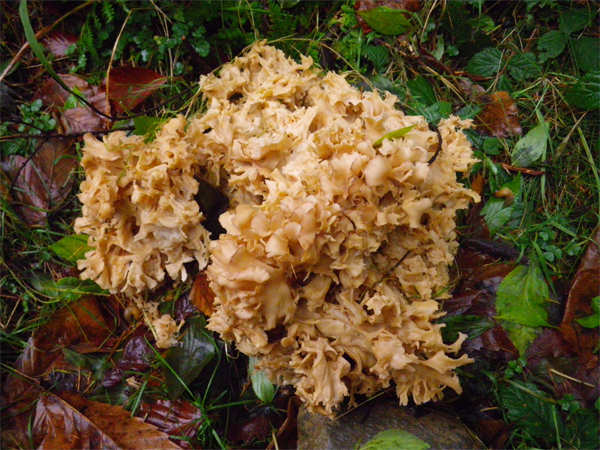 Known as' Cauliflower Fungus' or Sparassis crispa it attacks the roots and sometimes the base of conifers. 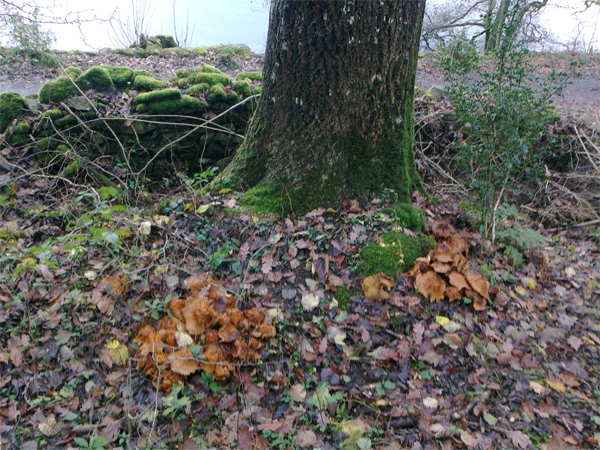 These two finds both flagged up some possible issues for us, but, it’s worth noting that these fungi create vital habitat for insects, birds and even food for red squirrels. The scalycap is one fungus eaten by red squirrels. How's this for a Xmas Tree? 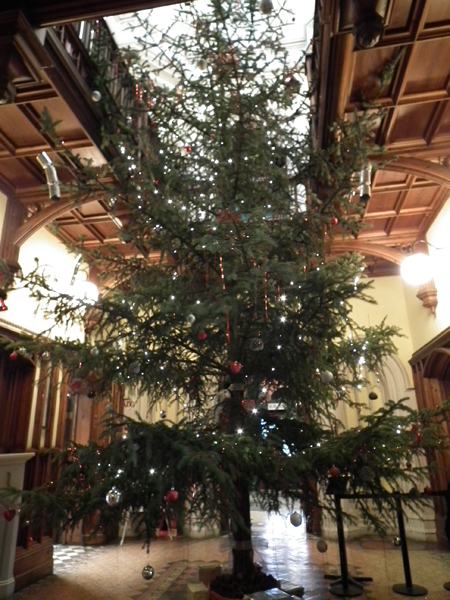 Herioc work by the Rangers got the tree into and standing upright in Wray Castle (no easy task!). If you enjoy decorating Xmas trees you can do just that at Wray Castle which is open at weekends for Xmas-themed activities until Xmas Eve. You can check out the range of Xmas activities here. Having witnessed the demise of the English Elm through the 1970’s as tree after tree succumbed to Dutch elm disease I guess it was just a matter of time until we repeated the scenario with another invasive species, after all we spend millions of euros each year moving untold quantities of plant and animal species around Europe and Asia so it should not really come as a surprise. 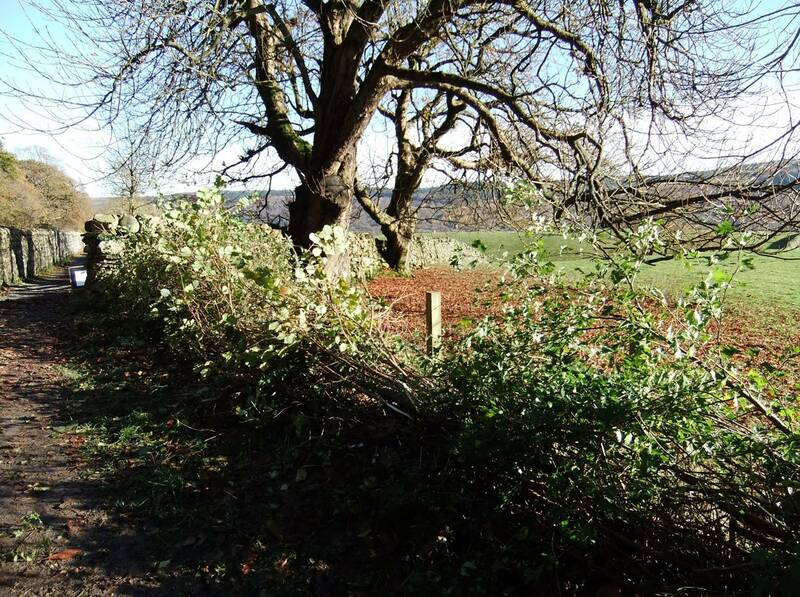 The Lake District with its network of small farms and field systems is more or less dominated by Ash (Fraxinus excelsior) and nearly all of the mature trees in the farmed landscape are also ash! Furthermore many of the ashes are ancient pollards with a history of management going back hundreds of years and these very special trees support a wonderful array of wildlife including rare mosses and lichens and an unknown number of insect species. 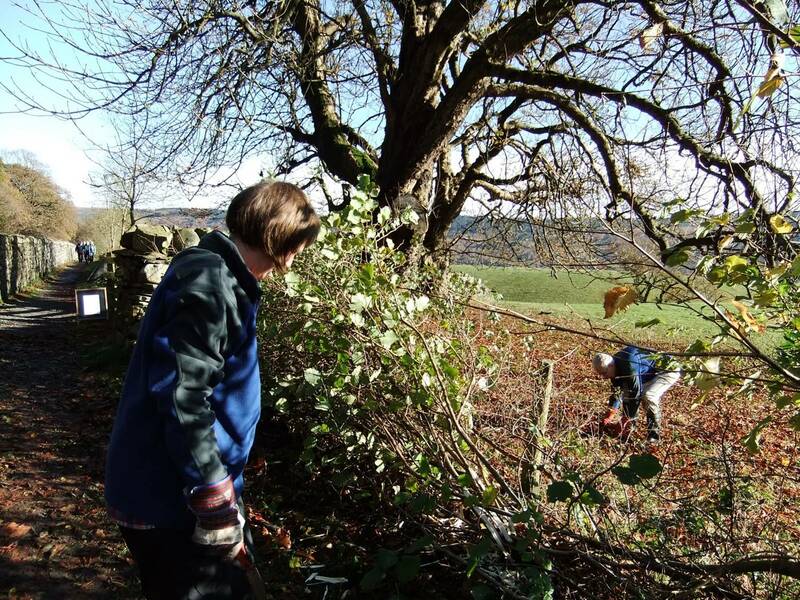 The ash pollards form part of ancient wood pastures and in February of 2012 we planted over 600 new ash trees at Watendlath, this small idyllic hamlet is home to several hundred ancient ash trees many over 400 years old. The news of this new disease, Ash Dieback (Chalara Fraxinea) caused concern and having a contact at FERA (Food & Environment Research Agency) I was able to have these newly planted trees tested earlier this month and a few days later received the bad news that they were indeed infected. Following advice from FERA and The Forestry Commission, we took steps to try to save the woodland. The trees had been planted in tubes and fallen leaves were nicely contained within them, one week later and all had been removed and burnt on site to try to save the woodland. Was this successful? Only time will tell and next summer will reveal the true extent of the disease. The area will be closely monitored for any signs of infection by this nasty little Ascomycete and every effort made to reduce its impact on this incredibly ancient landscape that we put so much effort into conserving. It is the start of November, it is getting dark, and I am freezing cold. 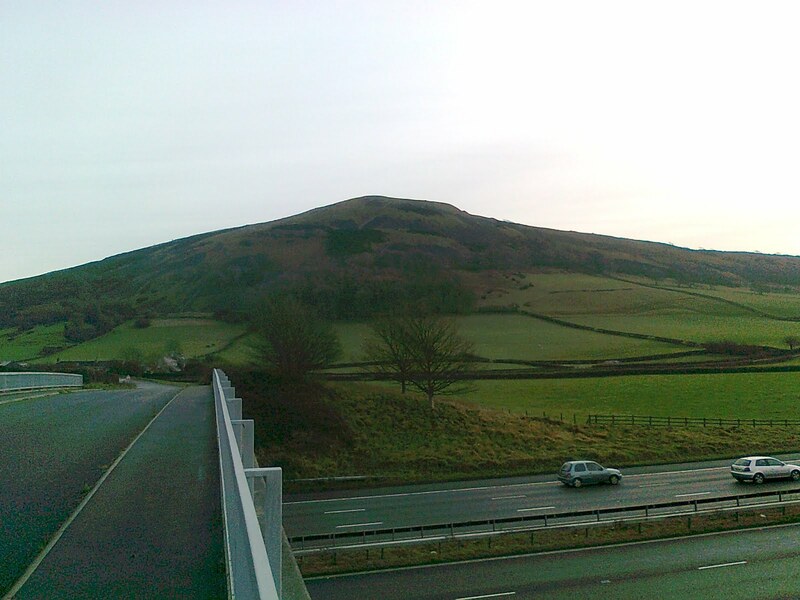 I am standing on top of a landmark that for millions of people every year marks the place where they turn off the motorway for the start of their Lake District visit. It is a place that millions of people every year drive within half a mile of. It is a spectacular, unique place with spectacular wildlife and even more spectacular views. Yet of those millions of visitors maybe 1 percent will know its name; and maybe 1-thousandth will have been here. 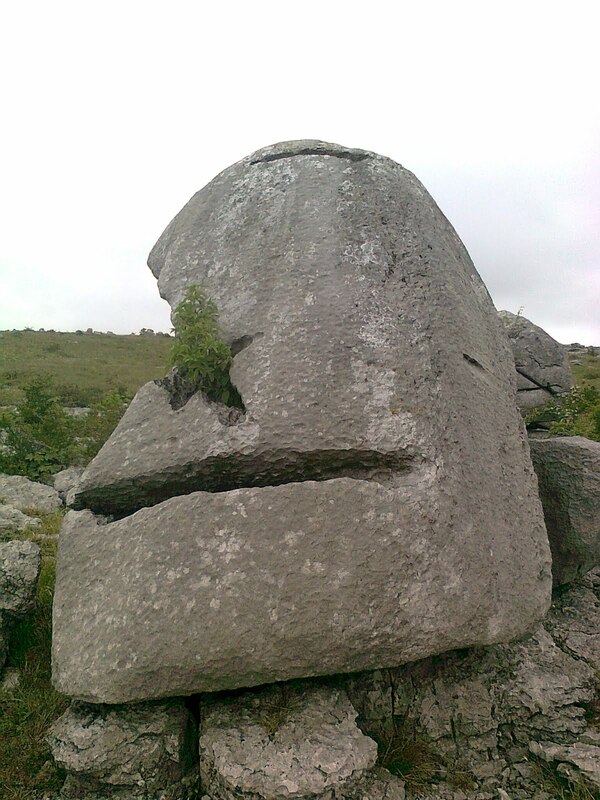 It is Farleton Knott – a hidden world that is well worth a visit. 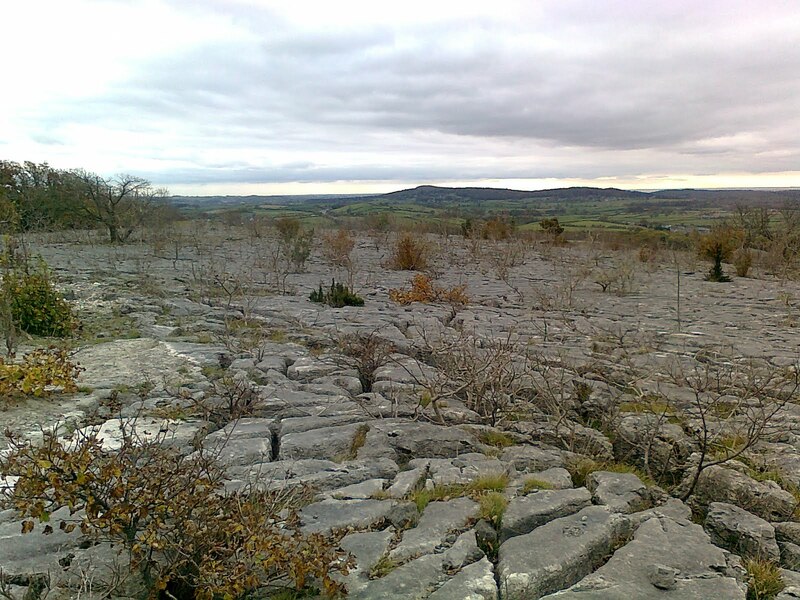 Farleton Knott (the part owned by the National Trust is also called Holme Park Fell) is managed as part of the Trust's Arnside & Silverdale property, but actually it is 4 miles further East, just off Junction 36 of the M6. It is linked to Arnside & silverdale by having the same ranger team and by being grazed by the same tenant farmer as part of the Bank house Farm tenancy; and by being made of the same Carboniferous limestone. But it is a very different place altogether. 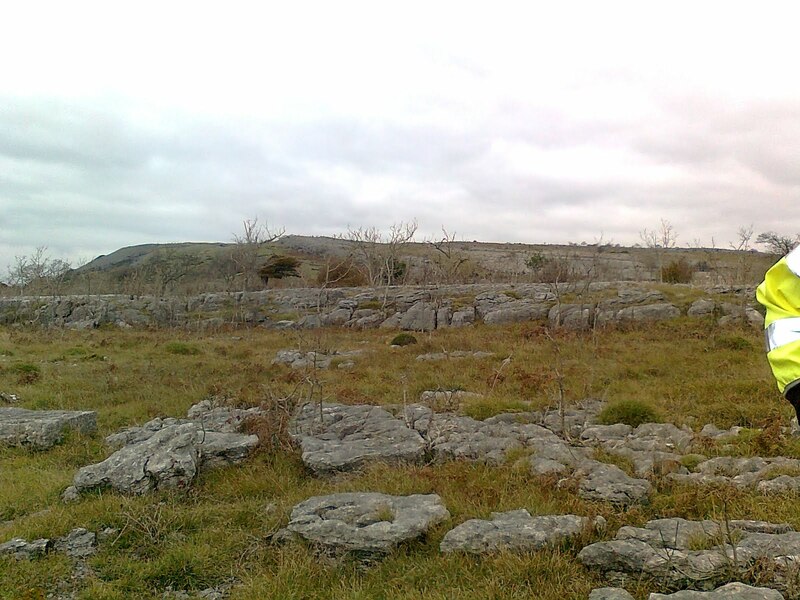 Most of the Trust’s land in Arnside and Silverdale has a homely feel. You are never too far from a cottage or cafe; you are always likely to bump in to a fellow walker or even someone you know. Farleton Knott feels more than its 4 miles away; and has very little in common with the celebrated Fells of the Lakes either. 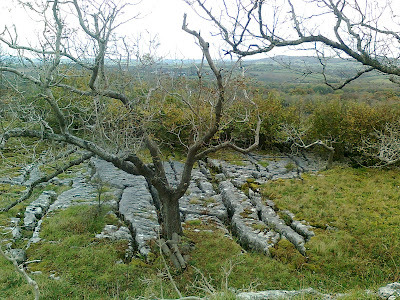 Its cousins are The Burren in Ireland; or Malham cove in the Yorkshire dales. For, uniquely in Cumbria, the sheer and shining scree slops that lead up the fell from the M6 corridor top out at an enormous limestone pavement that is as awe-inspiring as it is surprising. At any time of year it is worth the visit. 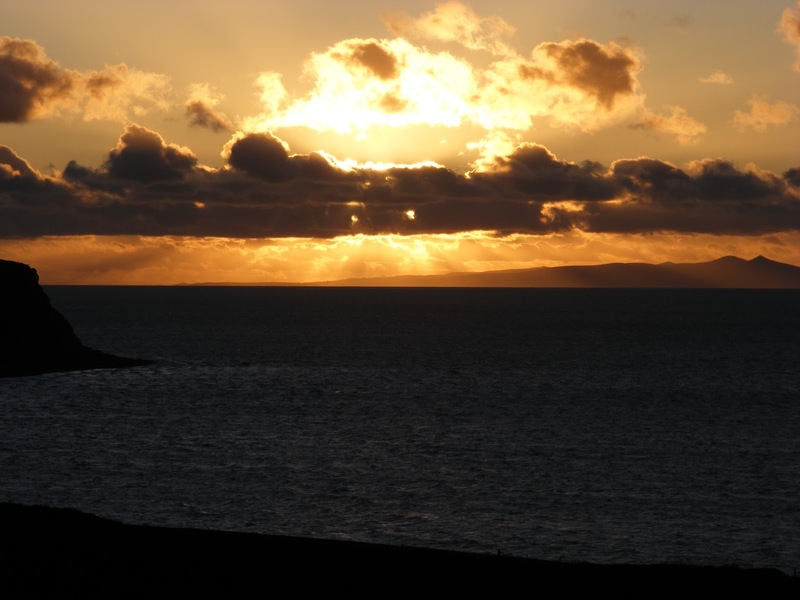 The views are 360 degrees and take in 3 counties, to the Cumbrian Fells, the Yorkshire Dales, Morecambe Bay, Bowland, Blackpool. The timeless experience of tramping over all that rock connects you physically to an earlier time away from the modern world. Whether jumping from clint to clint (the slabs) or peering into the grikes (the cracks) to see what fears (or maybe flowers) lurk there ready to pull you down. Or maybe getting up close to the prehistoric glacial erratic rocks that were carried here during the Ice Age and which survive, out of place and teetering, like Easter Island statues. 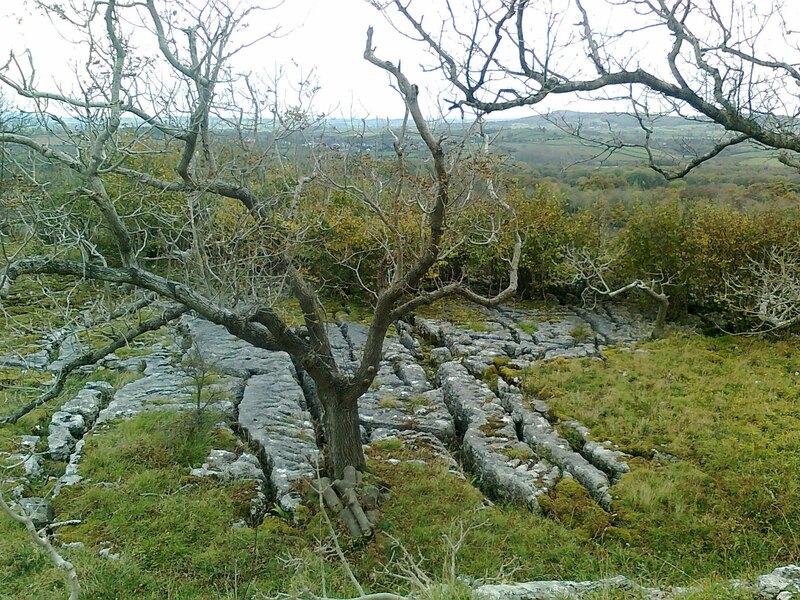 Then there are the ash trees: their roots attached to bare rock get almost no nutrients and are very susceptible to drought, not to mention browsing sheep and deer; so that they grow so slowly that a 300 year old can be only 2 metres high and with the girth of a human leg. In summer the fell blooms with limestone flowers – rock rose and dropwort, fly orchids and early purple orchids a; dark red helleborines and hawkbit; a host of rare butterflies like high brown and small pearl-bordered fritillary fly in search of hairy violets; there is the yammer of yellowhammers from the gorse bushes. Now in November though all is grey/green and all is quiet, save for the bitter moan of the eastern wind that, bizarrely, is bringing in the bulgey-eyed woodcocks for the winter. I know the woodcock as a wader-like bird of wet woodland – so what they find to dip their beaks into to eat amongst the rocks and screes up here is beyond me. It is that kind of place though; its laws are its own. Last winter Ranger Alan saw a stoat up here that was pure white in its winter ermine coat. Today I have come here with Ross, our new Trainee Ranger, as part of a visit to sister site Clawthorpe Fell National Nature Reserve. Sitting on top of a pillar of rock in the middle of Holme Park limestone quarry immediately next door to the National Trust land, Clawthorpe Fell is a place with no human access save the occasional visit by Natural England’s reserve manager Rob (who is our guide for the afternoon). Even with Rob there, we need escorting along terrifying quarry roads made of loose shale, weaving between quarry dumpers bigger than a house, an induction by the Quarry managers, helmets and fluorescent jackets, and flashing lights. 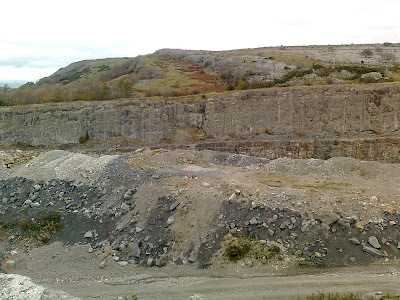 Very slowly the quarrymen, their dumpers and diggers are using the quarry waste shale stones to join the lost world of Clawthorpe Fell back up with Farleton Knott/ Holme Park Fell with a land bridge. So perhaps one day you’ll be able to go and experience it for yourself. Until then, though, don’t worry: you can get to Holme Park Fell at any time, and it is well worth it. You’ll be alone with over a square kilometre of 350 million year old rock for company as the throngs rush past on the unheard motorway hundreds of metres below you. It’s quite a feeling. Holme Park Fell is not the easiest place to get to! Try parking opposite Holme Park Farm on the A6070, 2 miles south of the A65 at M6 junction 36, towards Burton and Holme at grid ref SD530795. From there you can either walk or mountain bike up the bridleway. 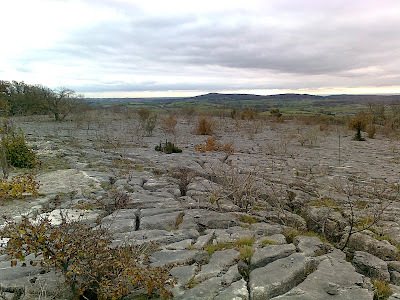 Alternatively, follow the Limestone Link by bike or on foot from the Clawthorpe to Hutton Roof road at SD552788. It’s been another busy week. At work I’ve been out with volunteers and we have taken down the large picture frame that was on Crow Park overlooking Derwentwater. 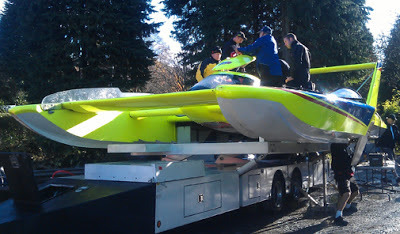 It is now in storage and we hope to give it a new site next spring. It has been a hugely successful installation and we have had lots of positive feed-back. We took the opportunity to do what so many visitors have done this year and our volunteers had their images framed against a stunning backdrop. Also with the help of volunteers, the winter programme of car park maintenance is underway and we have been realigning the boulders that mark out one car park ready for resurfacing. We will then be marking parking bays to help visitors make the best use of the available space. I then took a few days leave and tied them to a weekend so that I could do a First Aid course with the Mountain Rescue Team. It was one of the best courses I have ever done. ... and then my turn to practise suturing belly pork! The course leader was doctor Paddy from WMT who taught us lots of techniques e.g. cannulation for IV access, suturing and appropriate use of drugs. It was a course designed for advanced first aiders and for expedition medicine. The National Trust takes animal husbandry very seriously and when it comes to ensuring their visitor attractions are representing the correct era in history, even the poultry must be right. The Georgian property of Wordsworth house in Cockermouth, William Wordsworth childhood home, had a new addition to their garden last year. Three hens joined the team of dedicated garden staff and volunteers, doing their bit to help control garden pests by eating any that they were given. The fine looking ladies were an attraction in their own right and proved very popular with visitors as well as those who work in the gardens but late in the season all was not well. Despite having the finest hen house, carefully made the Georgian way with hand made nails and native hardwood timber, one of the hens had 'flown the coup' seeking an adventure of her own, perhaps inspired by Wordsworth's famous poetic descriptions of the lake district on the doorstep. Fearing that she had been stolen, a safer place was sought for the remaining two birds to overwinter and they came to stay with my flock in the woods. Just days later the missing hen Hetty was found, she was in the building next door to Wordsworth house where she had been eating flys and spiders to her heart's content. Being a rare breed Scott's dumpy hen (one of only a few breeds of hen kept in the Northern England in Georgian times) and not having especially long legs seemed to have limited how far she was able to "wander lonely as a cloud"
Reunited with her hen housemates Poppy and Maisey, all three have been happily scratching and pecking ever since and after a busy summer season in the Wordsworth House garden being admired by many and eating as much as a hen can, they are back in the tranquillity of the wood for another winter. for two weeks on Prospect training. Thought it was going slowly ! Beavers, burial mounds and bikes. Work-wise I was back up Stoneycroft track last week to retrieve the bags of grass seed that the footpath team and volunteers did not need for their maintenance job up there. Once again the ATV did a great job accessing the high fells with heavy loads. Its other great advantage is the time it saves. In one trip it can shift what could otherwise take a number of people days to do. Force Crag mine across the valley in middle distance. I’ve also spent a few days with Jan staying about 20 miles south of Oban on the coast. We took the bikes and cycled around the area. Whilst we were there, we took the opportunity to visit a Neolithic and Early Bronze Age site at Kilmartin. We joined a guided walk and saw superb examples of both rock art and chamber cairns. Kilmartin is surrounded by an astonishing number of prehistoric sites including burial cairns, rock carvings and standing stones. We also have many archaeological sites in the Lakes including the rock art and burial mounds we have in Borrowdale and also Castlerigg Stone Circle. Sometimes I include these in guided walks so it’s always useful for me to see how someone else does the kind of thing I do and watching our guides at work gave me some good ideas that I can use in future. Unfortunately, one of our hopes didn’t quite work out. There have been some planned releases of beavers back into some areas of Scotland so we went looking for them. We found plenty of evidence of their presence but, sadly, didn’t actually see one. We knew that we would have to be incredibly lucky to see them but there’s always a chance! Of course, we also managed to enjoy some stunning views plus do some great cycling and walking. This group is made up of a hardy and dedicated bunch covering all of the National Trust properties in Cumbria; no job is too big or too small. 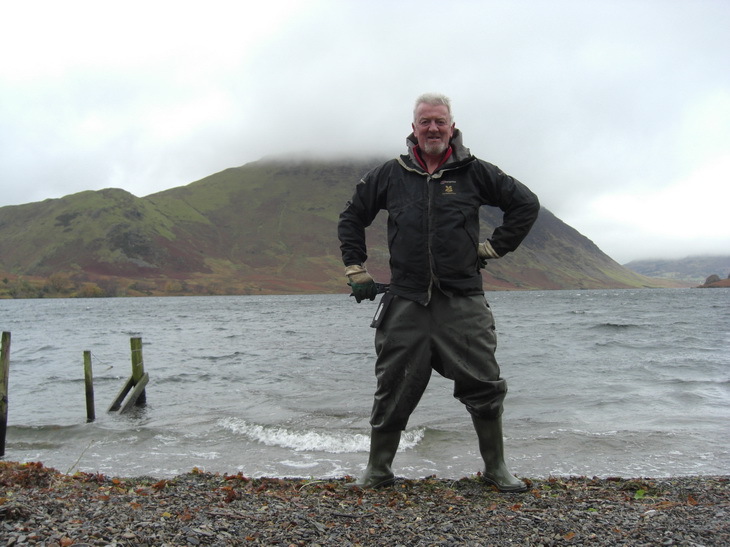 A good proportion of the team are based in the lakes but some travel from as far away as Cheshire and the Midlands, which emphasises the commitment and dedication to Conservation and National Trust. The team hard at work clearing the site ready for laying. 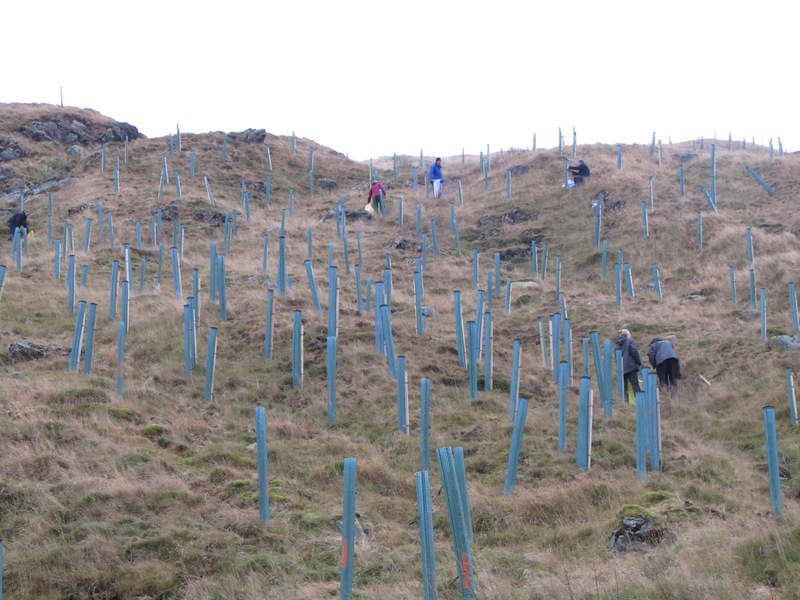 The weekend saw the team working near Coniston on a hedge laying day. Hedge laying is one of everyone’s favourite tasks, It was a great day had by all with fantastic sunny weather for a change?! Taking a step back to admire your handywork! After a well earned lunch and Birgit’s cake (not for the faint hearted! ), the team finished off laying the hedge. Coming soon to a property near you! If you’re feeling inspired or interested in the work they do or you just want to meet the team, they’ll be working at Ash Landing near the car ferry on the Western side of Windermere on the 2nd of December...let's hope the weather is as good again! November has been a month of changing weather and work sites, firstly we carried out the finishing touches to our joint project with the Fish Hotel in Buttermere, there were a few unkind comments about the length of time the project took but overall we’re happy with the results. Next off, with Ranger Dan back in Borrowdale leading some farm walks at Seatoller farm (a place he knows only too well) I was joined by contractor Craig Shaw and his dog Jamie, our task? To repair- rebuild the boundary fence at the top of Kirkclose Wood by Buttermere, luckily as it was quite a steep walk up to site, the materials had been flown in previously, unluckily they had been dropped a considerable distance away!! 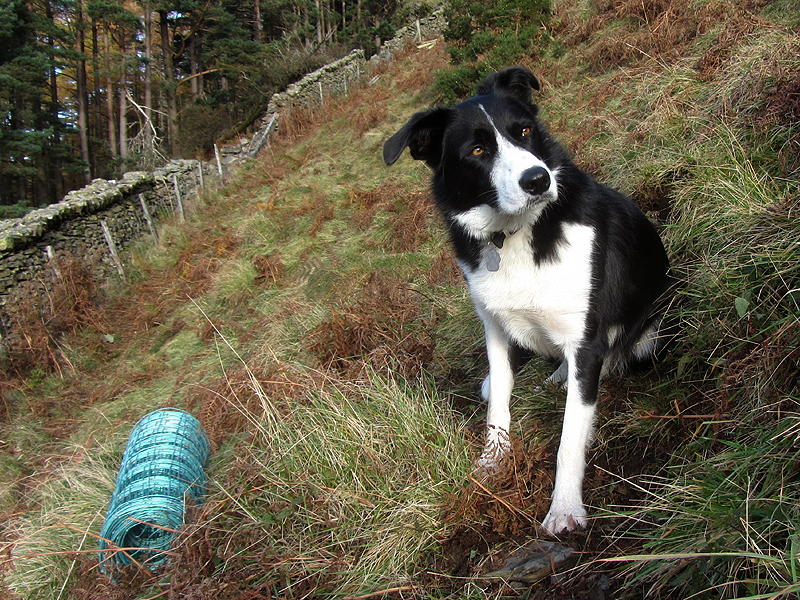 So first we were forced to make far too many trips up and down the hill with posts and wire. We were blessed with magnificent autumn weather, crisp bright and cold with just the odd flurry of snow, and offering some stunning views. Could you wish for better views? A classic indication that we were well into autumn was the presence of several hundred fieldfares and redwings, a sure sign of cold weather approaching. Jamie says "You expect me to carry this?.........." Our peace and quiet on site was interrupted occasionally by the sound of chainsaws drifting across the lake, our forestry team were working in Burtness wood and on particularly calm days the sounds of falling trees could be heard, click here to see and hear how fast they work. Following on from this and after a well earned half term break we re grouped, our usual Thursday volunteer team joined us at Netherhow on the shores of Crummock Water to help us repair a gate and fence which had been repeatedly vandalised over the summer, you have to wonder why given the amount of fallen trees and branches lying around, someone would prefer to burn a gate? Now this was a fairly straightforward task but as we once again had combined work with water and our volunteers and some miserable weather, it was almost guaranteed to turn into yet another Whitehall farce. The end of the fence was deep in the lake, not a problem, we had some waders, Ranger Dan seemed quite pleased to tell me that they didn’t fit him so I did the decent thing and struggled out into the lake looking like a cross between MC Hammer and some demented water based superhero, can’t quite think which one. All was going smoothly with me in the water and the volunteers and Ranger Dan on dry land when suddenly a large piece of wood fell as if from nowhere right into the water beside me causing a large splash and soaking me entirely! Volunteers David ,Christine and Jim told me an enormous bird had flown across and dropped it and of course I had no reason to doubt them. Very soon it was lunchtime and the job was completed, a quick tidy up of the site and all the rubbish loaded onto the quad and trailer and we were away again, off to Fletcher Fields to finish some walling which we’d begun the day before. Anyone know where this bit goes? As winter start to make its presence felt, here are a few of snaps taken by the National Trust's Whitehaven and Ennerdale Ranger, Chris Gomersall to show its not all rain, mist and wind at the same time. 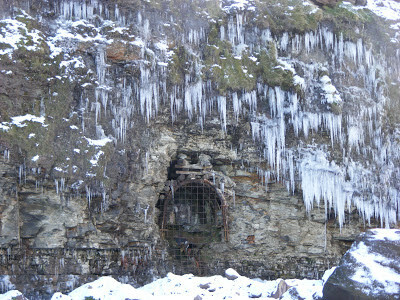 Sometimes its clear and colder. 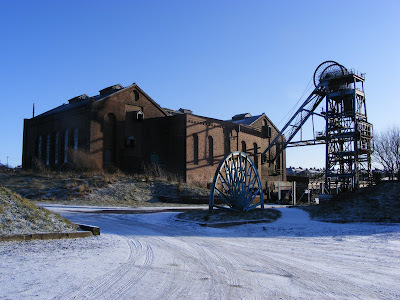 And when snow falls the lake district fells are not the only place worth a visit. So if its perishing outside then the chances are that visibility is excellent and if you can keep yourself warm its well worth stepping out. Have you seen Whitehaven in the snow? 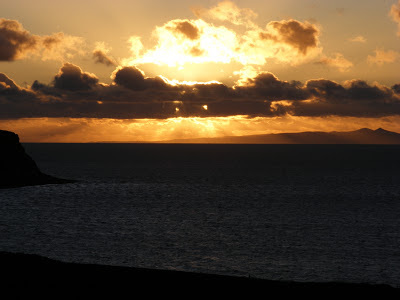 On Saturday Nov 3rd 2012 the National Trust hosted an annual free public bonfire event at Whitehaven's iconic Candlestick chimney offering mulled wine, soft drinks and cake to warm spectators who watched as the fire caught hold at 6.30pm. 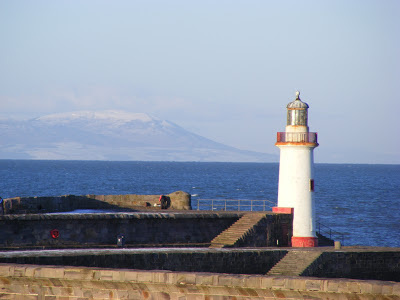 The location over Whitehaven's historic harbour gives great views of everybody's fireworks around the georgian town. Next years bonfire will go on tour starting in Whitehaven on Friday the 1st of November and moving to Keswick the next day on Saturday the 2nd of November 2013. How easy is it to make a footpath where there has never been one before? So how did we know what people wanted? The answer came from the Troutbeck Village Association who first suggested the idea of a new footpath taking walkers off the busy A592 road and across fields instead. This would not only make the road safer for all users but also create new circular routes around the village of Troutbeck. So the community wanted it, for their benefit and for the visiting walkers. To our advantage the best route was entirely across NT fields, and the tenant farmer was happy for the path to be made, so we were halfway there already. The route of the off-road path can be seen to the right of the road, closely following the hedge. The first gate is opposite the car on the bottom left, and the last gate is opposite the hotel car park on the top right. We decided that the path was best left un-fenced and un-surfaced because this didn’t impact visually on the landscape and would then be quicker and cheaper to install. Roland and Ray with their experience of installing gates started the work in mid September and had all the gates, steps and fence improvements completed by the end of October. 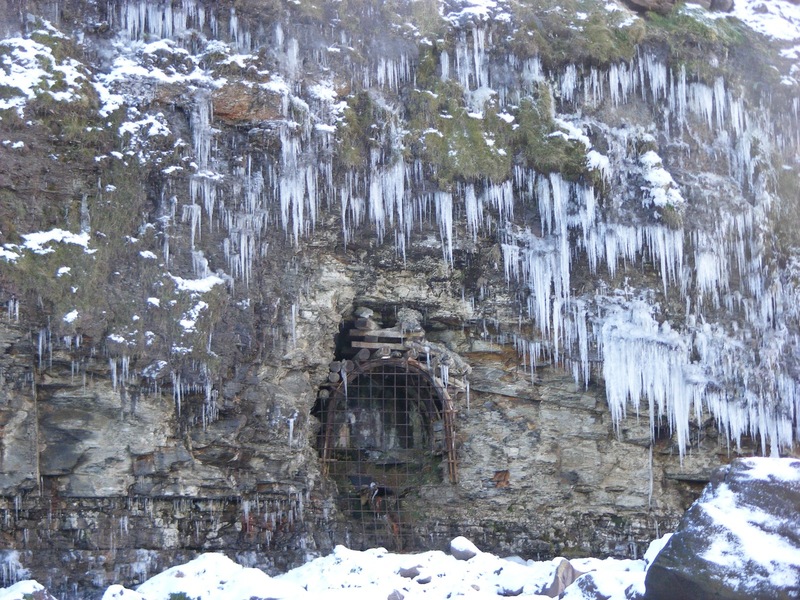 The first gateway and the only metal one used as this was within existing railings. The path was opened unofficially for a few weeks to see if any small adjustments needed to be made before the grand opening. 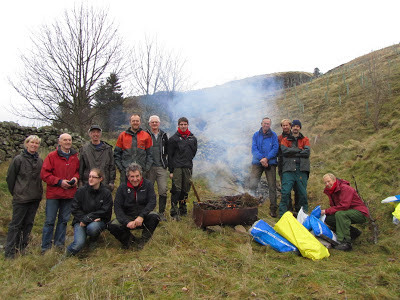 Naturally we invited members of the Troutbeck Village Association to the opening ceremony, along with the rangers and volunteers who helped make the path and a photographer from the local press. The ribbon was cut at 12noon on the 1st November by a local resident, marking the official opening of the Troutbeck off-road path. The opening ceremony attended by members of the Troutbeck Village Association and rangers. This has been one of the many ways I have done just that. I have also spread the word via newspaper and radio station coverage, through local businesses benefiting from the path, by incorporating the opening into the Great British Walk festival held nationally by the NT, and finally, it will go on the latest Ordnance Survey map. Last week's post shows that a Ranger's job can include tasks perhaps not naturally associated with the job... here's a couple of other things not normally in the job description! As November arrives it's time to get the steam yacht 'Gondola' out of Coniston Water for the winter and it's traditional that our Rangers give a hand. We thought you might like a look at how it was done last year when a time-lapse video was made of the process, it definitely looks like hard work! By way of contrast Gondola's exit from the water usually coincides with the annual Speed Week on the lake when very fast boats indeed go all out to break records. It makes an interesting contrast as we have the sight of the fastest and most modern-looking of boats sharing space at the pier with the traditional, slow and stately Gondola. It seems like the Rangers enjoyed it as well as the kids; and we think the smiles of these happy visitors says it all! And the Rangers aren't finished yet: during November while Wray Castle is open at weekends they will be leading Autumn Art and wildlife activities, so once again when a Ranger gets home and gets asked 'what did you do at work today?' the answer is likely to be an unusual one ! 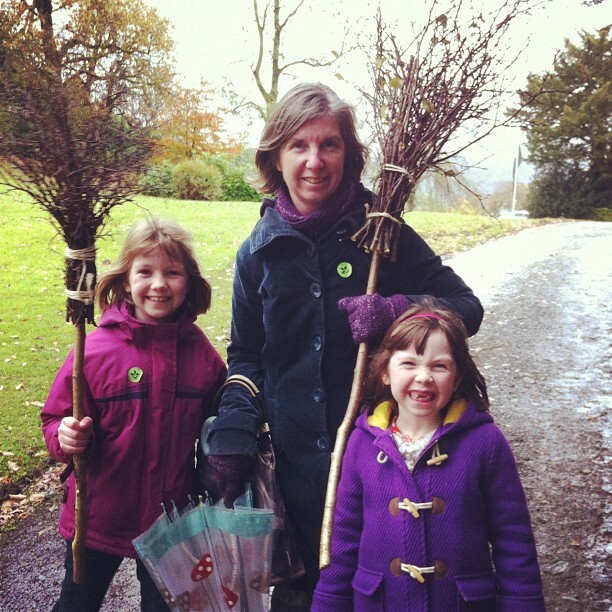 Find out about activities at Wray Castle until Xmas from our Events webpage or Facebook page. Most of this week I have been working on Friars Crag installing the riven oak fencing that I mentioned last week. I’ve had ranger colleagues and also my volunteers working with me so the job is going well. It’s a great place to work because of the opportunity to talk to so many people about what we are doing. Most of them were very complimentary about it. You can see for yourselves in the following pictures but Friars Crag is really a place that needs visiting to fully appreciate it. As we worked one day, I noticed a boy of about 10 years old and his parents. They arrived at the view-point and the boy said, ”Wow!” to which his mother replied, “I told you that you’d like it.” They had obviously conveyed their own appreciation of the place and had created a bit of magic for him. There was a strange contrast when I overheard a couple who were presumably making their way along the lake-side path but had taken the short diversion to the view-point. They reacted with, “Oh, it’s just a cul-de-sac.” That’s definitely one of the oddest descriptions I’ve heard of one of the most spectacular views in the Lakes! During the week we had school visits for three days. 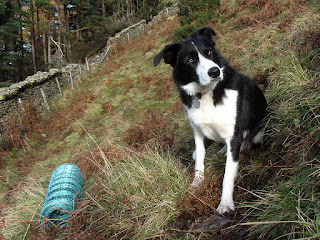 They stay in the Glaramara Centre and we go in to work with them in the morning then lead farm walks in the afternoon. I led the first day with Dan, one of the other rangers, assisting but then he took over to lead the other two days. Last Saturday I went with a few colleagues including Jessie to Cam Crag Ridge which is in Langstrath. It is a nice, enjoyable scramble and we practised rope-work with Jessie who is doing her consolidation year for her Mountain Leadership training. 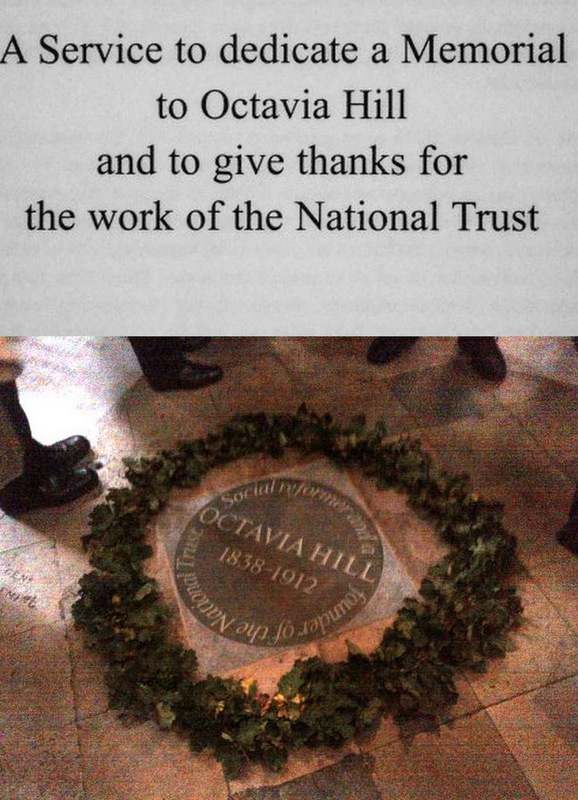 I mention that to contrast it with Jessie’s day on Monday when she did a reading in Westminster Abbey at a service for the dedication of a plaque commemorating Octavia Hill, one of the founders of the Trust. If you need an emergency job doing just call our two Rangers Jack and Andy. Over the summer we have had jobs coming in left right and centre. Here's a wee taster! First job was to pull a dead sheep out of Derwent water that started to smell not at all like the new fragrance by Lacoste. The second job was to unblock one of our donation cairn's. So we set off down to Friar's Crag with Anthony one of our foresters. Using the foresters tractor to lift the cairn on to the trailer we took it to the bank,also known as Bowe Barn! Once it was back at Bowe Barn, Andy and John started to dismantle the bottom part of the cairn. Once they had removed a few stones they were able to get access to the box, which then allowed them to prise the box open at which point they thought it was job done. How wrong were they, they then found out that it was blocked at the top. So we tried all sorts, threading wire down, rocking it side to side. Nothing worked, so I came up with the idea to get the pressure washer that we use to clean our vehicles to blast the money out. The picture above shows the process of using the pressure washer. After a couple of blasts we did manage to unblock it, with a few notes getting wet in the process, and the workshop slowly turning into a lake. We did find the reason why it was blocked up. Somebody thought it was too easy to put an old boat time table into a bin so he thought he would put it in our cairn instead! The next job was to go and repair a gate and rails that had been partially demolished by some seriously poor driving on the Catbells road. Perhaps they had been distracted by the view! So we set off with some new rails, posts and straining post. The first job was to get the old straining post out for which we had help from Peter Edmundson, our local tenant whose gate we were repairing. Next we put the straining post into the hole that the old post came out of, phew no digging. This was then followed by retensioning the wire to the new straining post. Lastly we nailed new rails on, taking time to line them up properly to make the field stoke proof. The two pictures below show a before and after. In contrast to the glorious outdoor pictures of the last few posts, there was a different kind of work day recently here at the volunteer centre. For a while we've wanted to replace our squeaky old bunk beds but could never afford it until recently when a very kind donor offered to give us a chunk of money for this purpose. The old ones were metal and had a rather 'prison' like feel to them, so we wanted wooden ones and we also wanted some kind of built in storage as that's rather lacking in the dormitories. After a bit of shopping around we found we could afford to by enough beds to replace all 11 of them Acland block, a real bonus as it's more expensive than you might think when you have a specific wish list like that! We got the order in and requested some of the ranger team to help put them together. It was a good job we did too, as they came in five seperate boxes per bed and with a complex set of instructions to follow. The delivery driver optimistically reckoned they'd take 'a couple of hours' to put together, which, after a bit of practice, was probably about right. The problem was that the beds were delivered just two days before a group was due to be using the block, after a delay due to a van breakdown. So the Acland block resembled a bizarre kind of highly pressurized game show, with a whole clutch of rangers frantically bolting and screwing them together. In the end the main body of the beds were all completed in time, but the built in storage was a different matter. These turned out to be quiet fiendish in design and need a few hours alone to put together, meaning we only managed three of them before the time was up. Now, the dormitories have a much warmer and more welcoming feel with a lot less squeaking going on. We've got a busy November ahead so won't get the chance to build any more storage units until December, but at least we have the quieter winter months then to tackle them. Many thanks to rangers Luke, Sarah, Glenn, Nick and Stuart for helping us out - there may not be somewhere for everyone to put their pants just yet, but at least they've got somewhere to sleep! Sarah, Fix the Fells 'woman at the top' lives up to her title!